New Mini 3" long. 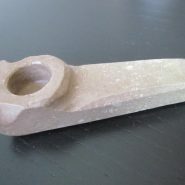 handmade black onyx stone pipe made for the average pipe smoker. very good for dabbing wax. easy to hide in your pocket. at all times. when going to work or visiting your grandparents put it in your pocket glass pipe and forget about it. buy me now! and feel the joy.